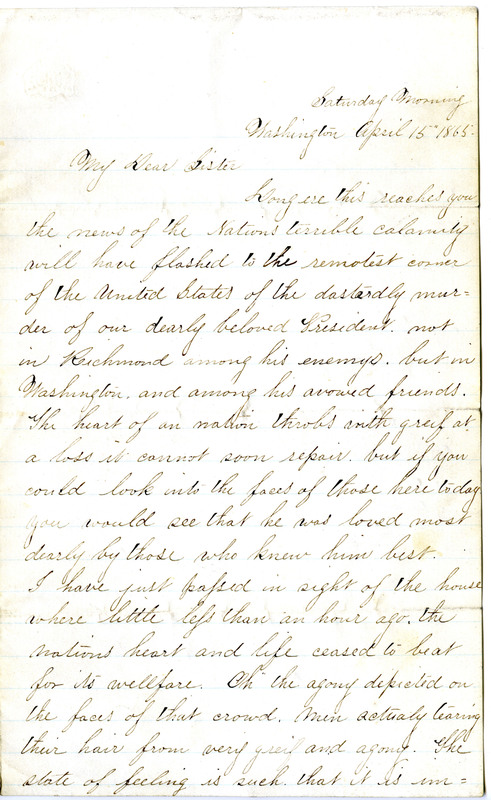 In this Letter a young woman, Mary, living in Washington, D.C. writes her sister, expressing her grief over Lincoln's assassination and tells of the atmosphere of mourning in the city. She goes on to relate her own account of the night of the assassination. Long ere this reaches you the news of the Nations terrible calamity will have flashed to the remotest corner of the United States of the dastardly murder of our dearly beloved President not in Richmond among his enemies but in Washington and among his avowed friends. The heart of the an nation throbs with greif at a loss it cannot soon repair but if you could look into the faces of those here today you would see that he was loved most dearly by those who knew him best. I have just passed in sight of the house where little less than an hour ago the nations heart and life ceased to beat for its welfare. Oh the agony depicted on the faces of that crowd. Men actualy tearing their hair from very greif and agony. The state of feeling is such that it is impossible to tell what it may lead to after what is past it is not safe to judge what a day may bring forth. The streets are patroled to keep the people (and its not the roughs) from assasinating every known simpathizer with the rebelion. The whole city is being draped in the heaviest mourning the bells are tolling and every-thing and every-body wears the sadest aspect a human eye ever looked upon. What a change in one short day. Yesterday all was bright and joyous today, gloom and sorrow cover a nation. Yesterday was a lovely day, today is dark and cloudy. It seems as if the sun refused to shine on the dark deed.